GEORGETOWN, S.C. — The Coast Guard attended an unveiling ceremony Thursday at the South Carolina Maritime Museum in Georgetown. The event was to observe the reception of the Georgetown Lighthouse Fresnel lens. The highlight of the unveiling was the lighting of the lens, which allowed guests the opportunity to see exactly how light shines through this historical artifact. 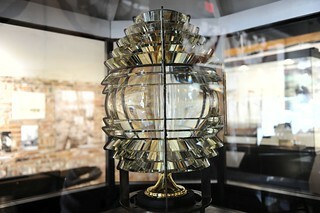 The fifth order Fresnel lens served in Georgetown Lighthouse, until 1999. Afterwards, the light was placed on display at the Coast Guard 7th District building in Miami. The light has now returned to once again serve as the centerpiece of Georgetown’s rich maritime history. The lens will be on loan to the museum for a 10-year period, which is renewable. Fresnel lenses were invented in 1822 by French physicist Augustin Fresnel. These lenses are designed to have concentric rings of glass prisms above and below to bend the light into a narrow beam. At the center the lens is shaped like a magnifying glass, so the concentrated beam is even more powerful.